The Series "From Jesus to Christ: The First Christians" is a historical documentary series that tells the epic story of the rise of Christianity. The four-hour program explores the life of Jesus, his death, and the men and women whose belief, conviction, and martyrdom created the religion we now know as Christianity. Drawing upon historical evidence that has created a revolution in New Testament scholarship, the series challenges familiar assumptions and conventional notions about Christian origins. Archaeological finds have yielded new understandings of Jesus' class and social status; fresh interpretations have transformed earlier ideas about the identity of the early Christians and their communities. Through engaging, on-camera interviews with twelve scholars-New Testament theologians, archaeologists, and historians-the series presents their contributions to this intellectual revolution. Together they represent a range of viewpoints, a diversity of faiths, and a shared commitment to bring new ways of thinking about Christianity to a public audience. "From Jesus to Christ" reveals that Christianity did not arise as a single, uniform, and coherent movement, but as one marked by diversity of opinion, practice, and belief. From the beginning, the movement was forged by conflict as the early Christians wrestled with their Jewish heritage, collided with paganism, challenged the authority of the Roman Empire, and clashed with each other. The series conveys the early Christians' struggle to understand Jesus and the meaning of his message and suggests that their ancient world of 2,000 years ago may not be so very different from our own. No matter what your faith, or what you believe, this series will ask you to reconsider what you think you know about a story that has so decisively shaped Western civilization. Program 1 examines how Judaism and Roman rule, Pax Romana or "Roman peace," shaped Jesus' life. Jesus was an ordinary Jewish resident of this time, but new archaeological findings show that he was probably not the humble village peasant often portrayed. Nazareth, where he was born and raised, was a suburb of the major city Sepphoris. As a Jew, Jesus was influenced by the diversity and the tensions characteristic of Judaism at that time. 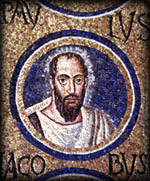 Jesus was most likely arrested and executed by Roman authorities whose principal concern was to keep the peace. The Romans had little tolerance for those it judged disruptive of the Pax Romana, punishing them in many ways, including crucifixion. The death of Jesus was a Roman act; there was little if any notice taken by Jewish people. Jesus was another victim of the Pax Romana. It is a stark ending, and it leaves some important questions. Jesus was born before 4 b.c.e. and died around 30 c.e. ("of the common era," the equivalent of a.d.). The timeline is short, but the historical scale is large. What was most surprising about the historical information of the program? Program 2 explores the period after the crucifixion of Jesus and traces the beginnings of the Jesus Movement, in those early years before it was called Christianity. It began as a sect within Judaism. Along the way, the early Christians began to branch out and to spread their message to non-Jews or gentiles (meaning "nations"). Around 50 c.e., the Apostle Paul travelled away from the traditional centers of the Jesus Movement and began to found new churches in Greek cities. His letters to these fledgling congregations mark the first writings of the New Testament. Meanwhile, expectations about the coming of the Kingdom of God would culminate in a catastrophic Jewish revolt against Rome from 66-70 c.e., ending in the destruction of Jerusalem and the Temple-the center of Jewish spiritual life. The traumatic failure of this revolt would dramatically affect the future for Jews and Christians. Why do the scholars refer to this emerging religion as the Jesus Movement instead of Christianity in its early years? How did the early followers of Jesus spread his message? How do their messages and methods compare to those used by fledgling religions today? What conditions allowed Christianity to grow as quickly as it did? Program 3 follows the story of the first attempts to write the life of Jesus-the Gospels. They were products of social and religious reconstruction in the period after the war, ranging from roughly 70 to after 100 c.e. The program looks at how these stories were passed down before they were written and how the writing of each Gospel reflects the experiences and circumstances of early Christians. They do not all tell the same story of Jesus because each one is responding to a different audience and circumstances. During this time, a growing tension appeared between the emergent Christian groups and their Jewish neighbors. The result was a process of debate, identity, and separation that shaped both religious traditions forever. And there were still other external forces, including a second, devastating Jewish war, the Bar Kochbah revolt, which erupted in 132 c.e. 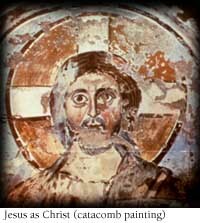 Why are there so many different images of Jesus in the Gospels? How are the authors of the Gospels interjecting their own beliefs and circumstances into the story of Jesus? What is the value of understanding how stories are influenced by the storyteller? As it became separate from Judaism, the Christian Movement would face new challenges-both internal and external. In the period between 100 and 300 c.e., the movement grew throughout the Roman empire. 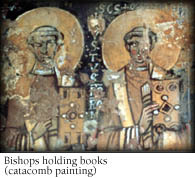 The Christian Movement also became suspicious in the eyes of the Roman authorities. At times there were heated debates-about beliefs, worship, and even about Jesus himself. At other times, faced by external threats, the Christian Movement pulled together. In the end, what started as a small sect of Judaism became a significant part of the population, enough so that a new Roman emperor, Constantine, decided that they should be part of the official religion of Rome. This was a momentous change for Christianity. As the fourth century dawned, the cross was transformed into a symbol of triumph and Jesus of Nazareth became Jesus Christ. In only three hundred years, the empire that had sent Jesus to his death embraced Christianity as an official religion and worshipped him as divine. What difference did Rome's embracing of Christianity make? What impact can a government's acceptance or rejection of religion have on religion and government? What religious movements of today could become dominant religions in the future? What conditions would be necessary for a religion to grow as quickly as Christianity did? Like paganism, what religions today are in danger of extinction? What steps can a religion take to ensure its survival? How does learning new historical information affect faith? Who were the "heroes" featured in the program? What similarities/differences did they have? Do the heroes of antiquity remind you of any contemporary heroes? What about today's world is similar to the time of the early Christians?